CNN Football Club: Gaizka Mendieta answers your questions! Gaizka Mendieta will be the star guest for this week's edition of the CNN Football Club (Getty Images). 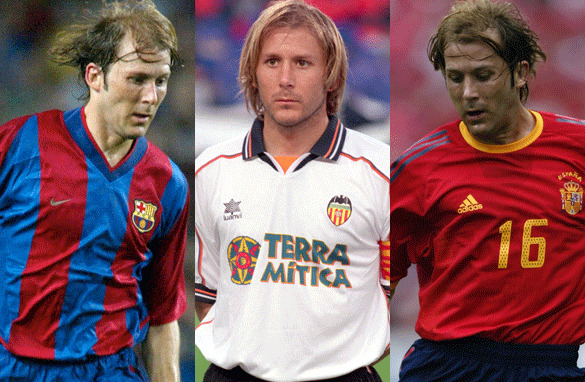 Gaizka Mendieta led out Valencia in two European Champions League finals and played for Spain at both Euro 2000 and the 2002 FIFA World Cup in Japan and South Korea. Now, CNN Football Club has put your questions to the former Barcelona, Lazio and Middlesbrough star. After debuting with Michael Owen last week, CNN’s new half-hour weekly global debate show ran the rule over the Champions League second-round ties in the company of Mendieta, who reached the final of Europe's top club competition in 2000 and 2001. We put your questions to the Spanish playmaker. What was it like to walk out in two consecutive Champions League finals? And how did it feel to take a penalty in one of club football's biggest games? Also on the show, CNN's Pedro Pinto, in the company of Mendieta and former Chelsea and Tottenham Hotspur midfielder Gus Poyet asked whether Paris Saint-Germain's mercurial striker Zlatan Ibrahimovic is a hero or a villain? Don’t forget to tune in to the CNN Football Club on CNN International at 1700 GMT on February 21. Due to unforeseen circumstances, German star Michael Ballack was unable to take part this week's show, but CNN Football Club hopes he will be able to take part in future programs. I want ask a question: Mendieta how do you cope with yourselve after so much espection and as a human you couldn't meet up with all of them some times. Hi. This is Abir from Bangladesh. Here's my question for Mendieta: What was exactly going through your mind before you scored the injury-time equalizer from a penalty against Yugoslavia in Euro 2000? my questions is on health after a professional sports career: Do you experience and sort of pain nowadays? We see Nadal, at the young age of 26 struggling with constant pain... do you thing athletes have been pushed too far during their regular seasons? won't CL victory for either bvb or shakhtar will be "is exactly what the doctor ordered" for today's modern football? Do you see yourself ever becoming the manager of a football club?